Selling yoghurt in Gaza in an attempt to make some sort of living. Credit: Eva Bartlett/IPS. In his work as Gaza-based communications officer with Oxfam GB, Karl Schembri interacts on a regular basis with some of Gaza’s most impoverished Palestinians, poverty he says is avoidable. “Gaza cannot be called a humanitarian situation, it’s all man-made. It’s a situation of de-development, where the infrastructure and knowhow was there and development was occurring,” he tells IPS, referring to the years before 2006 when, after Hamas was democratically elected, Israel imposed its suffocating closure of the Gaza Strip. In its August 2012 report, ‘Gaza in 2020: A Liveable Place?’ the United Nations (UN) draws the same conclusion. “One of the main reasons for the economy’s inability to recover to pre-2000 levels has been and is the blockade of the Gaza Strip,” says the report. Banned from exporting anything, including agricultural goods, furniture, textiles, and food products, the vast majority of Gaza’s factories have shut down, affecting the hundreds of thousands of Palestinians formerly employed there. “Gaza’s economy was utterly destroyed during the 2008-2009 Israeli war on Gaza, including 95 percent of factories and businesses,” says Khalil Shaheen, director of economic and social rights for the Palestinian Centre for Human Rights (PCHR). “Under Israel’s illegal closure of Gaza, the total ban on raw materials has impaired the ability of these factories to operate again,” Shaheen tells IPS. Roughly 80 percent remain closed, or are scarcely operating. “The fishing community has been completely affected by the daily Israeli navy attacks and by being denied access to the sea,” he says, noting that Palestinian fishers are forced by Israel’s unilateral decision to fish within three miles of Gaza’s coast. A September 2012 UN report cites the unemployment rate “for refugee youth in Gaza at 59 percent,” a staggering statistic foretelling that the dramatic unemployment levels will not decrease any time soon. 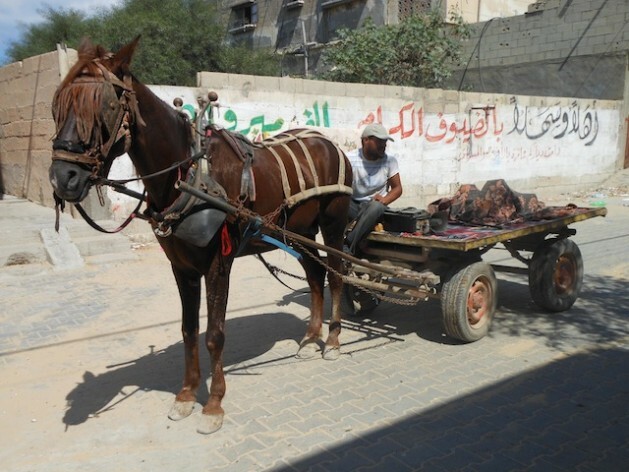 The few jobs that remain in Gaza under siege are some of the most dangerous. The risks for such a pittance are enormous. According to medics, since 2006 more than 160 Palestinians have died while working in tunnels. “The majority were killed and injured by Israeli bombings of the tunnels, or tunnel collapse and consequent suffocation, or electrocution,” says Shaheen. In the past two months, Egyptian authorities have been destroying and closing tunnels. Shaheen estimates that at least 150 tunnels have been totally destroyed, and another 150 shut down. “Forty thousand used to work in the tunnels. Now its 5,000 at best,” he says. Unemployment not only affects families’ purchasing power, it affects their morale, says Oxfam’s Karl Schembri. The self-immolation of a young man from Gaza’s Beach Camp earlier in September 2012 brought to light the less-discussed issue of suicide, formerly uncommon in the predominantly Muslim Gaza Strip. “Suicide here is a sign that Palestinians in Gaza are living with very little hope and few opportunities to build towards a better future,” says Shaheen.